From racy America to his hometown in the interiors of India, it was a long journey indeed for Siddharth (Shiney Ahuja). But nothing could match the mind-boggling journey that now lay in front of him. For it was a journey into an astounding maze in which each step meant mystery, discover, surprise, shock and revelation. With open arms, his large extended family welcomes the US based Siddharth & his newly wed wife Avni (Vidya Balan) when they come home. But what the family resists is Siddharth’s insistence on staying in his royal ancestral mansion during his stay. His uncle Badrinarayan Chaturvedi (Manoj Joshi) particularly has no qualms about voicing his displeasure. For it was that very mansion that held in its realm, a deadly secret that had repeatedly destroyed the family for generations. The scientifically inclined Siddhart pays no heed and starts staying at the palatial mansion with Avni who is equally modern in her thinking…But soon enough the couple is forced to rethink their decision…Unforeseen happenings, mysterious elements, horrific indications and life-threatening incidents swarm their path. Suddenly it becomes a situation that urgently had to be dealt with before it got too late. 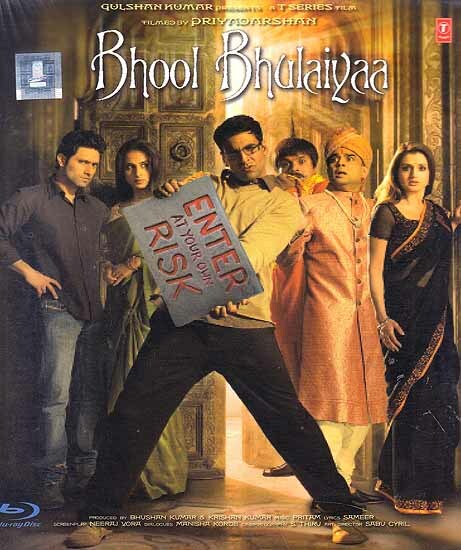 Siddharth instinctively finds the solution in his dynamic Doctor friend Aditya (Akshay Kumar). When Dr. Aditya find his way into the mansion, he is a man on a mission. He just had to find the cause of all the upheaval before the effects caused more harm than could be imagined…Where did the answer lie??? The Scientific world or the Mystical one??? The puzzle had to be solved…It is not long before Dr. Aditya discovers that nothing is what it seems and what seems, is not… and that the devastating reality was enough to shatter all truths. Blu-ray disc takes you beyond high definition! Pure picture and sound quality – true to the original source master.